I’m pretty sure these are some of the things we can expect for tomorrows upload with perhaps the items we saw in last weeks sneak peek videos. I’m not really loving this running long sleeve but it looks amazing on this model. It looks like the wide stripes with the darker contrast panels on the sides may have a slimming effect. 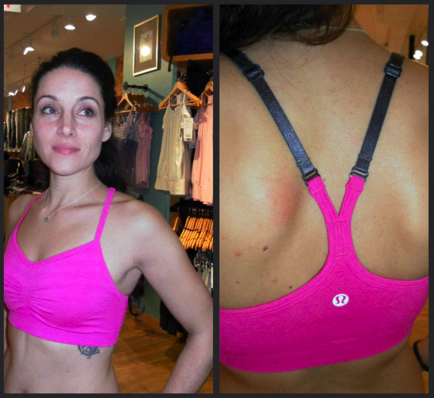 This seems to be a low support option for under Cool Racerback Tanks. I wonder what the price is considering the tank is $68. Don’t have much hope for this tank on me since its so body hugging and a very thin fabric. It’ll show every lump and bump. I do really love the color though. Deep Indigo is gorgeous! "A New Unicorn Tears Print Coming Soon?" "More Photos Of The Latest: Ebb & Flow Tank, Push Ur Limits, Run: Switch Back LS"